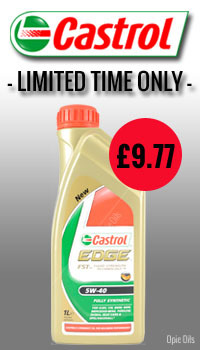 With Castrol updating the label design across their range of “Edge” products, we have been left with some old labelled Castrol Edge 5w-40 FST fully synthetic oil in 1 litre bottles that is in need of a home – this label change has been brought in so recently, that some retailers are still selling what we class as “old label” as current stock. 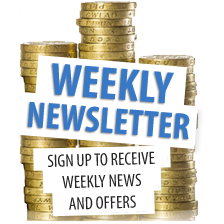 However at Opies, we like to keep our stock up to date and current, so we will be selling our remaining stock of this fantastic product at the super low price of £9.77 – Just use the discount code “OPIEFORUM” at checkout to get this special offer! There is only limited stock of this available, so get your orders in quick – once it’s gone, it’s gone! You can find it HERE. If you need a quick top up before setting off on a long drive, then this 1 litre offer is perfect for you – it’s worth having the peace of mind that your oil levels are where they need to be before hitting the motorway. It’s also good to know that you’ve got a top of the range, fully synthetic 5w-40 in there that adapts to your engines every need, even under the most severe pressures – another bonus of using Castrol Edge. This features what Castrol call “Fluid Strength Technology” – A dynamic system that actively strengthens the oil, and responds to the level of protection that your engine requires.